"... the entire article is 'WHAT HIS CLASSMATES SAID ABOUT HIS POLITICS.' Why take that out?" "Without explanation, it seems @denverpost just determines what is approved speech, and edits accordingly." "Does @denverpost think high school seniors can truly label Karl as a 'good political thinker'? That's in the article." 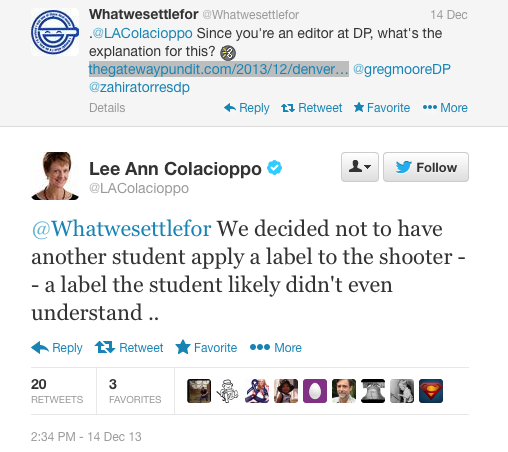 "I guarandamntee you that if a student told @LAColacioppo that the shooter was right wing, it would not be stealth edited out of the piece." "I just find the 'teenagers are dumb' edit hollow when the entire article is about what his classmates were saying." The "teenagers are dumb" point is especially pertinent, because many of them are eligible to vote. I guess any day now we should expect an editorial from the Post, or at least an op-ed from Ms. Colacioppo, about how the voting age needs to be raised to 21 to keep these uninformed kids out of the voting booth. Sure. The gunman responsible for Friday's shooting at Arapahoe High School in Colorado is being described as a "socialist" by his fellow students. "He was friendly enough. Very proud of being a socialist. He was very outspoken on his political views," student Angie Mock said. "To him, it just meant economic -- more economic equality." So it's not like Pierson's outlook was a secret. The Post's behavior was shameful enough. Colacioppo's defense indicates that her paper would rather insult students, their high school, and Post readers' intelligence rather than have the S-word (and, presumably, communism, as will be seen shortly) appear to be associated with violent and deadly acts. What's the point in subscribing to a publication such as this? Several outlets, including CNN, CBS, and the Wall Street Journal, have also indicated that Pierson's "held communist views," "alienated peers with rants about communism," and "once wore a shirt emblazoned with the letters U.S.S.R. and described himself as a communist." As the evidence mounts that "socialist" was a relatively mild description of Karl Pierson's outlook, will Lee Ann Colacioppo and the Post have the integrity to back down from their obvious censorship? A related post is at BizzyBlog.com.